Graduations, births, marriages, promotions; these are happy occasions where we invite our community to come together to bear witness. There is power in people holding space for each other as we move through important points in our lives. In the boating community, one such opportunity is the naming of a beloved vessel. 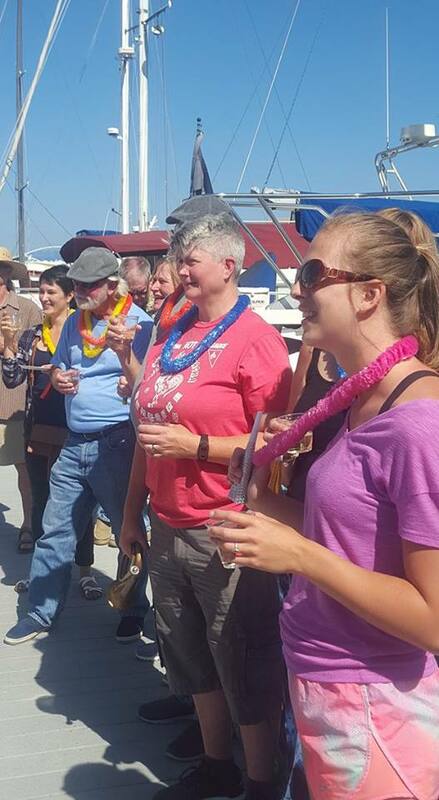 Thus we were invited to participate and witness in the highest and best, and most entertaining, way the re-naming of S/V Ella Minnow Pea, owned by friends Trish Harkess and Trevor McInnis down at the Foss Harbor Marina. Soon we will be calling them neighbors! Ella Minnow Pea is a Cape Dory Intrepid 9 meter sailboat. In spite of her smaller size, I’m always a little envious of Ella because of her underbody. She was built with the same robust features that the original Cape Dory’s are built with, but she has a fin keel, making her more maneuverable than the full-keeled versions. Many is the time I wish Galapagos had more of a fin keel. Alas…compromise. We were pleased as can be to be invited to the renaming party. It was our first ‘marina community’ event and made us feel that when we move aboard, soon, we will have a ready-made neighborhood of people who welcome us into their fold. It’s something we’ve looked forward to for quite some time and lessens the sting of leaving our comfort zone in suburbia. The marina community gathered together for food and drink up in the common area before heading down to the dock for the ceremony. You know, sailing is fraught with superstitions. Or, maybe better stated, opportunities to examine your personal belief systems. We like to practice a little thing called ‘better safe than sorry’ on board Galapagos, so we invoke the protection of our gods and goddesses on a regular basis, and we’ve been known to offer sacrifices, even when virgins are nowhere to be found. As with many things boaty and religious, there is a tried and true ceremony that is used in the naming or re-naming of a vessel. But it’s kind of, well, just a bit patriarchal. And, you know, traditions change! I loved the way Trevor re-wrote their ceremony to include homage to goddesses of the sea while keeping the historical tone of the ancient words; bridging the best part of the past with the values of the here and now. The sea is our great mother, as part of our earth. We are connected to her in flesh and in spirit. It is fitting that the goddesses be honored and invoked and to leave them out surely would be asking for trouble. Many cultures invoke the protection of the goddess, in many forms. If you want to use her ceremony in naming your own boat, Trevor would be honored. Be sure to write and tell us about it! Trish and Trevor did the appropriate thing for their vessel by removing from her all references to previous names. They waited a year for her and for the gods to settle down before going for the renaming. When we named Galapagos, we removed all references to previous names, and then we did the DE-naming ceremony rather than waiting the full year. When the heart is pure, there are many paths to the goal. On the day of her renaming, Ella Minnow Pea was dressed in her best flag-waving attire. I’ve never seen her look so saucy. It was as though she knew she was special, that all eyes would be on her as she waited patiently for her baptism. We all carried champagne to the dock to toast to the sea as Trevor took her place on deck and prepared to speak the ancient words. The ritual of the speaking of the words, the connection to our hearts, the purity of the desire, and the witnessing of the community. All were present on a beautiful sunny day. Supplied with horns, celebratory leis, libations, and even a hand drum, the party was ready to usher Ella Minnow Pea safely into the annals of Neptune. Glasses filled all ’round, Trevor spoke the invocation. Our toasts, ‘To The Sea!’ , shouted loud and strong, we drank. There was, perhaps, plenty of toasting. Champagne was thrown to the winds, and to the sea, and on the decks of the beautiful Ella Minnow Pea. At last, her baptism complete, her name was unveiled on the stern. And that’s when Trish and Trevor won the marina. Could a name and logo be any cuter than this? Could it be any more appropriate for a boat that is saucy, and sea worthy, and spirited, and can swoop and turn like a kingfisher? I submit it cannot. Here’s to Ella Minnow Pea. Here’s to Trish and Trevor. Long may you sail together. Thank you so much for inviting us to be part of your world and for helping us feel a connection of belonging to our new community. Ceremonies make us wax nostalgic. Want to remember with us the renaming ceremony of Galapagos? We toasted to the winds and the gods of the sea out on the Pacific Ocean, as was appropriate for our plans. It was a memorable day where we learned that you can’t sail north from Oregon. And the goddesses? They are represented by my mermaids, hanging around the boat. 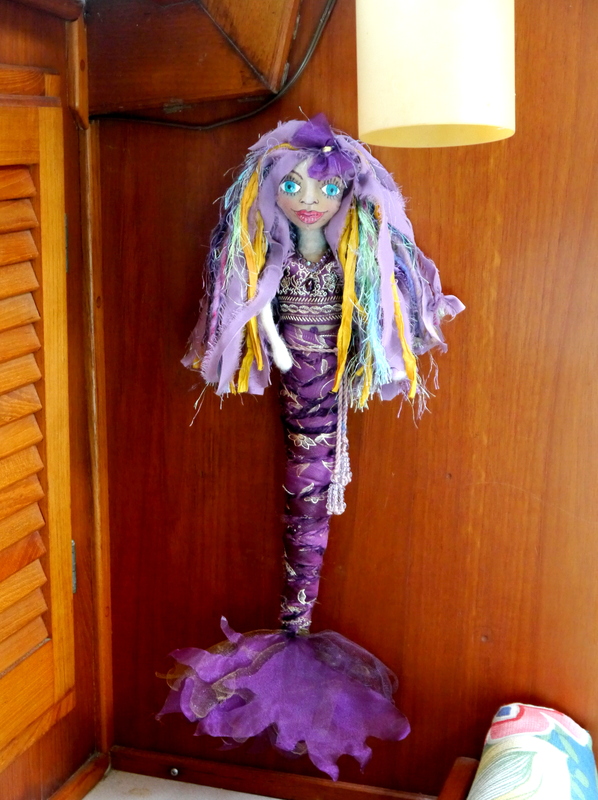 This entry was posted in Community, Mermaids and Goddesses and tagged Sailing community by Melissa. Bookmark the permalink. What a great day! And you’re so right. They nailed the graphics for their name. I might be a little biased though. The kingfisher is my favourite bird — I love their call! I love them, too. They are so funny and acrobatic. It was a terrific day. Better safe than sorry! It was seriously fun! That is a great name and logo!! We didn’t do any ceremony when we renamed our boat – hope that doesn’t come back to haunt us. You should follow our ‘better safe than sorry’ strategy and make some kind of sacrifice. Spitting and spinning three times usually works. Have to ask…… L M N O P ? And the mom kingfisher is not about to abide the youngsters any longer than absolutely necessary!